Think about the last time you put on sunscreen. Chances are you slathered it over your shoulders, neck, and chest, and then (with a separate, non-pore-clogging formula, of course) moved onto your face, massaging it into your forehead, nose, chin, and cheeks. This makes you a shining example of sun protection, right? Almost, but not quite — you've left the thin, delicate skin of your eyelids exposed. Holly Thaggard wants to change that. 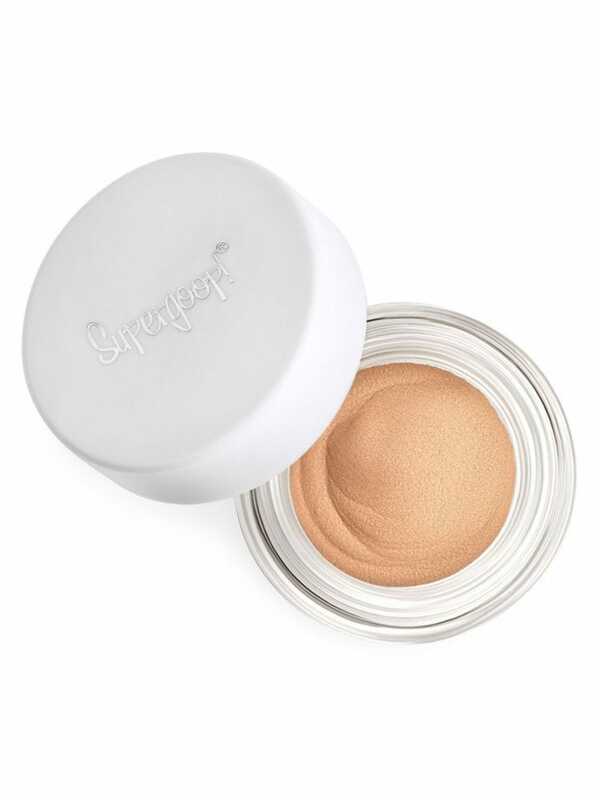 Last month, Thaggard, the founder of always-innovative sunscreen brand Supergoop, launched Shimmershades, a lineup of three eyeshadows with SPF 30. "Over the years, I've had conversations with consumers and, for the most part, I heard people were avoiding putting SPF around the eye area because they were afraid of irritation and their eyes watering," Thaggard tells Refinery29. "So not only were they not putting it on, but they were avoiding it purposefully." The teeny-tiny area just isn't at the top of anyone's "places that need sun protection" list — and that's a mistake. "Risk of sun damage on the eyelid is very prevalent due to the nature of thin skin," says dermatologist and skin-cancer specialist Ariel Ostad, M.D. "The eyelid is prone to sunburn, and sun damage leads to not only wrinkles and crow's feet, but also various skin cancers, including basal cell carcinoma, squamous cell carcinoma, and melanoma." Specific signs of skin cancer, like scaly or scabbing growths, can also pop up directly on the eyelid. Skin cancers around the eye can also be especially difficult to treat, explains Andrew F. Alexis, M.D., the head of the Skin of Color Center at Mount Sinai in New York City. "One can imagine the treatment of the skin cancer is surgical, so removing skin around that delicate area is more complex than, say, the back, and can be associated with a lot more discomfort for the patient," he says. With all that in mind, now is probably sounding like a good time to start protecting your eyelids. Dermatologist Hadley King, M.D., recommends wearing broad-brimmed hats and UV-blocking sunglasses, as well as using products with SPF — like the Shimmershades. More than just a smart way to safeguard your skin health, the sheer, lightly shimmery shadows are also really, really good: The long-wearing formula can double as an eyeshadow primer or even a highlighter, and the neutral shades play well with other eye makeup. "We're not thinking what other makeup can we do, but how do we deliver the right product for everyone to protect their skin," Thaggard says. "Already, we're thinking about other very important places where SPF should be, from the eyes, to the hands, to the lips." With festival season upon us and summer on the way, Shimmershades couldn't possibly have come at a better time.